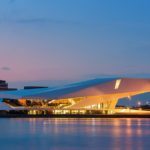 The EYE Film Institute Netherlands has moved to spectacular new quarters within Amsterdam, where the grand opening takes place on April 5. And losing no time, it will launch its first film festival on the same day. The building – the architecture of which is reminiscent of Japanese origami art – is located on an island directly across from the city’s central railway station. 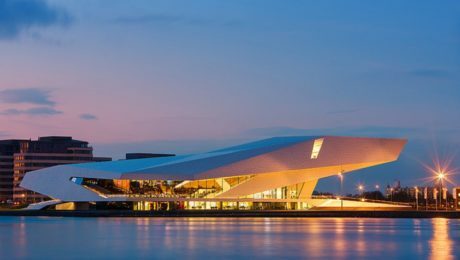 Thanks to its angled white aluminum façade, it is plainly visible from well inside Amsterdam’s Old City. But the outside of the new EYE, which cost 40 million euros to build, is not its only impressive feature. On the inside, it boasts state-of-the-art, top-quality projection equipment from Kinoton. From the heart of the EYE, called the Arena, ramps lead to four film auditoriums and two large exhibition areas. The Arena also houses the institute’s large film library. To meet the EYE’s exacting requirements for preserving historic film material, our Dutch distribution partner Rosbeek Techniek installed two specially built leading-edge FP 75 E-S REFERENCE studio film projectors, among other things. The projectors support all common picture and sound formats back to the early days of cinema. The two FP 75 E-S REFERENCE projectors with combination drives for 35mm and 70mm film will ensure flawless projection in the largest of the four auditoriums. Specially developed to meet the high demands of 70mm projection, the dual-format projectors deliver uncompromisingly excellent image quality and reliability. The globally unique, digitally controlled REFERENCE intermittent drive sets new standards with regard to focus, picture steadiness, and brightness. Outstanding focus is achieved by a significantly longer picture dwell time and vibration-free film transport into the gate. The technology of these projectors enables extraordinarily high light efficiency and very bright, flicker-free projection, which is especially important for showing silent films.